Some of the kids in Marilyn’s class have monsters. Marilyn doesn’t have hers yet, but she can’t just go out and look for one. Your monster has to find you. That’s just the way it works. Marilyn tries to be patient and the kind of girl no monster can resist, but her monster doesn’t come. Could she go out and search for him herself? Even if that’s not the way it works? 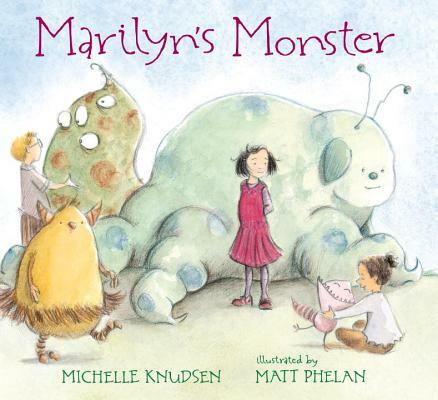 From favorite picture-book creators Michelle Knudsen and Matt Phelan comes a story about one little girl and the perfect monster she knows is out there . . . and what happens when she decides she’s waited long enough. Michelle Knudsen is the author of the New York Times best-selling picture book Library Lion, illustrated by Kevin Hawkes, as well as Argus, illustrated by Andréa Wesson, and Big Mean Mike, illustrated by Scott Magoon. She is also the author of the young adult novel Evil Librarian and the middle-grade novels The Dragon of Trelian and The Princess of Trelian. Michelle Knudsen lives in Brooklyn, New York. Matt Phelan is the author-illustrator of the picture book Druthers as well as the highly acclaimed and award-winning graphic novels The Storm in the Barn, Around the World, and Bluffton. He is also the illustrator of many books for young readers, including Always and I’ll Be There by Ann Stott and The Higher Power of Lucky by Susan Patron, which won the 2007 Newbery Medal. He lives near Philadelphia. Knudsen (“Library Lion”) once more offers a gentle reminder that sometimes you have to break a rule in order to do the right thing. ...It’s a lesson ideally suited for a helicopter-parented, standardized-test-soaked generation of girls — and boys, too — who are offered few chances to advocate for themselves and solve their own problems. Rich with feeling, it’s a warm, gently funny reminder to chase down one’s dreams, rather than waiting for them to appear on the doorstep. Knudsen’s charming story is a great fit for Phelan’s gentle watercolor-and-pencil illustrations. With just a few lines and brushstrokes, he depicts the wide range of Marilyn’s emotions, from wary hopefulness to sullen grumpiness to, finally, utter joy. The whimsical, friendly monsters are equally expressive, and their supernatural antics in the background will tickle funny bones. Little ones feeling lonely or worried about making friends will be empowered by Marilyn’s determined, take-charge attitude. A surprising spin on monsters with nicely effective artwork—and heart. Every one of Phelan’s monsters is wonderfully weird, and readers will have fun noting similarities between them and their human friends. In Mr. Phelan’s tender and witty pencil drawings, we see goofy, preposterous monsters choosing their human companions.... Ms. Knudsen has packed a surprising amount of relatable emotion into this story of humility and derring-do. This is an intriguing and offbeat story, and Knudsen’s matter-of-fact narration effectively draws readers into the situation, while subtly engaging kids at their emotional core.